Located 11 miles from downtown St. Louis, Missouri, the Jefferson Barracks Military Post is the oldest operational military installation west of the Mississippi River. Originally established in 1826 as the country’s first Infantry School of Practice, Jefferson Barracks received its name in honor of President Thomas Jefferson who had died earlier that same year. Jefferson Barracks was established on land that Thomas Jefferson had actually obtained as part of the Louisiana Purchase, which added to the argument that the first major military installation should bear his name. Jefferson Barracks was primarily a supportive military installation overseeing the westward expansion in the new western territory and assisting in protecting the early white settlers. In its early years of activity, troops from Jefferson Barracks were regularly called upon to keep hostile Indian groups at bay and keep the peace between them and the new intruders. At times, the Army actually had to protect not only the white settlers from the Indians, but they also had to protect the Indians from the settlers who were at times fighting with the nearby tribes over land and hunting rights. Jefferson Barrack’s 1st Dragoons, which were eventually re-designated the 1st Cavalry in 1861, participated in virtually every conflict in America such as the Seminole War, Mexican War, Civil War, Spanish-American War and much of the Indian expeditions involving the Cherokee, Iowa, Kansas, Mahas, Pawnee, Potawattomie, Osage, Otoe, Sac, and Sioux Indians. By the time the American Civil War erupted in 1861, many of the most well-known and prominent leaders of the war had been assigned to Jefferson Barracks while in the Federal Army. In fact, at one time or another approximately 220 Civil War Generals served duty at Jefferson Barracks such as Union Generals Ulysses S. Grant, William T. Sherman, Philip Sheridan, Winfield Scott Hancock, and Montgomery Meigs. Confederate Generals Robert E. Lee, James Longstreet, Albert Sidney Johnston, Joseph E. Johnson and Braxton Bragg also served here, as did American President Zachary Taylor and Confederate President Jefferson Davis. 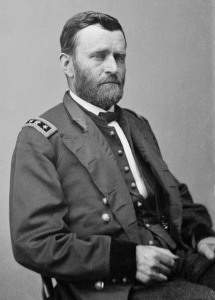 Ulysses S. Grant Commanding General of the United States Army. President of the United States. 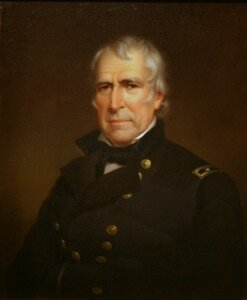 Zachary Taylor Commander of the Army of Occupation during the Mexican-American War. President of the United States. 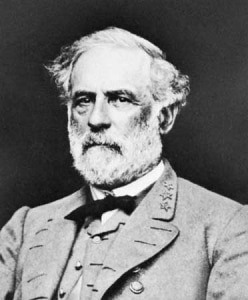 Robert E. Lee Superintendent of the United States Military Academy at West Point. Commander of the Army of Northern Virginia. U.S. troops from Jefferson Barracks played a leading role in the first action of the Civil War in Missouri. This was the capture of the Missouri State Volunteer Militia at Camp Jackson on May 10, 1861, an operation led by Capt. Nathaniel Lyon who would later ride off into immortality in the Battle of Wilson Creek and become the first General to die in the Civil War. Throughout 1861, troops from Jefferson Barracks continued to support the Union war effort in the Western Department. By March 1862, due to the increase in illnesses and causalities, the military aspect of Jefferson Barracks took a secondary part in order to provide additional hospital space for the Army Medical Department and Western Sanitary Commission. Although a Post Hospital had previously existed, the General Hospital opened in April 1862. By the summer of 1862, it was enlarged to accommodate 2,500 patients. 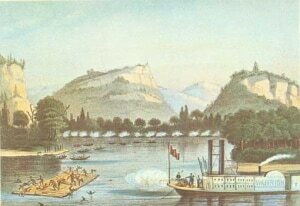 Steamboats, outfitted as floating hospitals supplemented bed space, as well as providing transportation to and from the battlefields. There were times during the Civil War that Jefferson Barracks was treating more sick and wounded soldiers than any other hospital in the nation and many of these soldiers never left Jefferson Barracks and were ultimately buried there. Following the Civil War, the military rapidly demobilized, leaving Jefferson Barracks nearly abandoned with the exception of small infantry units garrisons. In 1871, the St. Louis Arsenal was transferred to Jefferson Barracks and renamed the St. Louis Depot. Just seven years later, the Army’s cavalry commanded nearly all of Jefferson Barracks, except for the Ordnance Room. Starting in 1891, the military post was renovated and new facilities made of St. Louis brick were constructed. This was part of a larger movement in the United States military to transform itself into a more rigid, pristine, sharp and disciplined fighting force. With the reconstruction of the post, the Army stationed the 38th and 49th Infantry Regiments there. Additionally, Jefferson Barracks was transferred to the Department of Missouri and designated a primary post for the infantry. When the United States declared war on Spain in 1898, Jefferson Barracks was one of the largest recruitment and outfit depots in the country. In 1912, Jefferson Barracks made the headlines when Albert Berry made the first parachute jump in world history. When the Great Depression hit and President Franklin D. Roosevelt launched his New Deal, the Civilian Conservation Corps and Work Progress Administration worked significantly on Jefferson Barracks. The military prestige and honor continued through the World Wars as well. During World War II, Jefferson Barracks was the first and one of the largest Army Air Corps training centers in the United States in addition to being one of the country’s greatest recruitment depots. In addition, a German Wehrmacht and Royal Italian Army detention camp was established, holding hundreds of prisoners. After World War II, Jefferson Barracks was decommissioned due to demobilization and a focus on the Cold War. After decades of neglect, in 1960, St. Louis County took over and created Jefferson Barracks County Park. In 1998, Jefferson Barracks was named to the National Register of Historic Places. Several buildings across Jefferson Barracks have or are in the process of being renovated and turned into museums. The Missouri Air National Guard and Army National Guard are currently stationed at Jefferson Barracks and currently occupy the majority of the old barracks.